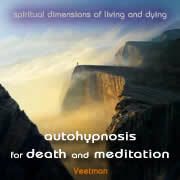 Guided Autohypnosis with suggestions for deep relaxation of body, breath, mind and heart, and for witnessing the body as dead. The imagination of death serves as a support to enter deeper levels of meditation, for understanding experientally the essentials of meditation: natural inner silence, non-judgemental awareness, and non-doing. This meditation allows deep acceptance and integration of the opposites of life and death.